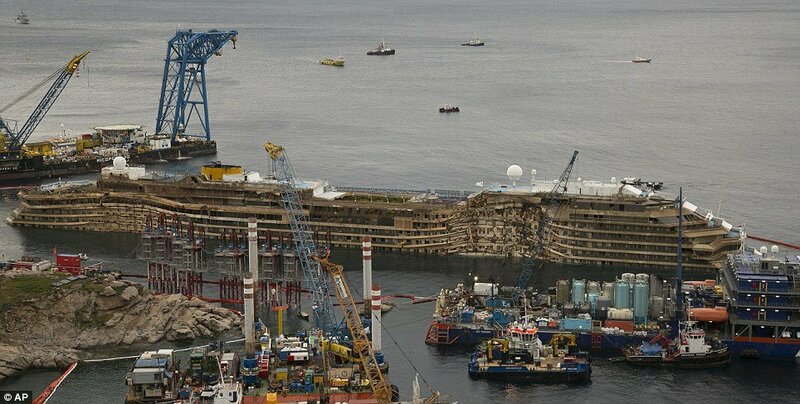 Home Tags Posts tagged with "giglio island"
Costa Concordia cruise ship was finally pulled upright after a dramatic 19-hour salvage operation. 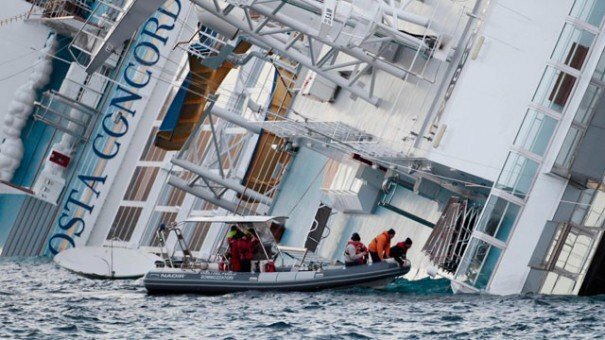 Salvage officials believe the bodies of waiter Russel Rebello and passenger Maria Grazia Trecarichi could be found in a lifeboat beneath the ship’s hull. It was hoped remains would become visible as the complex system of cables and hydraulics hauled the vessel – on which 32 lives were lost – from its side. Salvage teams worked through the night for 19 hours – and decks eventually became visible after being underwater for 20 months since it went down. The vessel is covered in rust and stained by the sea, while all the windows which were submerged in Giglio harbor, Italy, have been shattered. Kevin Rebello, the waiter’s brother, and Elio Vincenzi, passenger Maria Grazia Trecarichi’s husband, were expected to arrive on the island today. “I haven’t slept since yesterday,” Kevin Rebello said in an interview in Rome. Despite fears the ship may break apart before it reached the crucial angle of 65 degrees, the operation has gone smoothly, but slower than expected. The $800 million salvage effort is said to be the largest in maritime history, but there will be no saving the $575 million liner – destined for the scrapyard. Local residents and survivors said that there was an eerie feeling as the ship rose – and some said the sight reminded them of the tragedy. “Seeing it re-emerge is emotional for me,” said survivor Luciano Castro. The operation will not be complete until the vessel is towed away from the island – probably by next spring, after a full survey is done on the wreckage. Shortly after 4 a.m. today, a foghorn wailed on Giglio island and the head of Italy’s Civil Protection agency announced that the ship had reached vertical. Franco Gabrielli added that the operation to rotate the cruise liner – known in nautical terms as parbuckling – was complete. Some 36 giant cables were put across the hull to drag up the ship – and enormous tanks were welded onto its side and filled with water to act as ballast. No environmental spill has been detected so far, he said. Applause rang out among firefighters in the tent where the engineers made the announcement. An hour later, Nick Sloane, the South African chief salvage master, received a hero’s welcome as he came ashore from the barge that had served as the floating command control room for the operation. “Brilliant! Perfetto,” Nick Sloane said, using some of the Italian he has learned over the past year on Giglio preparing for Tuesday’s operation. Costa Concordia slammed into a reef off Giglio Island on January 13, 2012, after the captain brought it too close to shore. 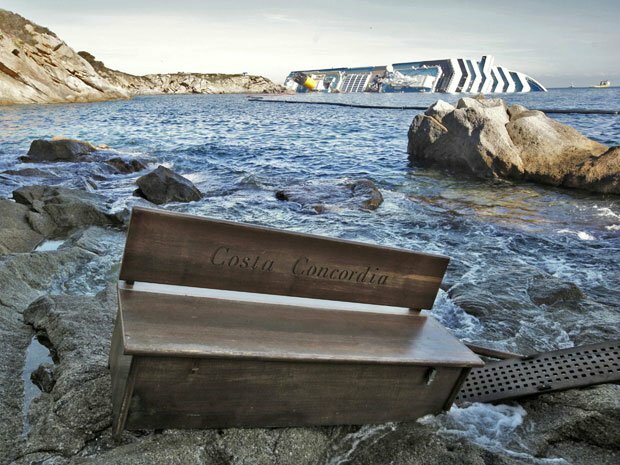 Costa Concordia cruise ship drifted, listed and capsized just off the island’s port, killing 32 people. 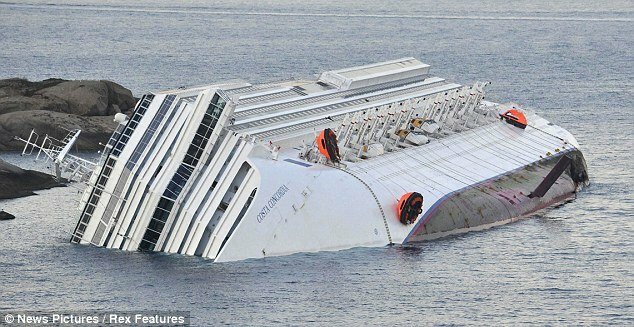 Divers searching the wreck of Costa Concordia cruise ship have found the body of a woman, bringing the death toll to 17. 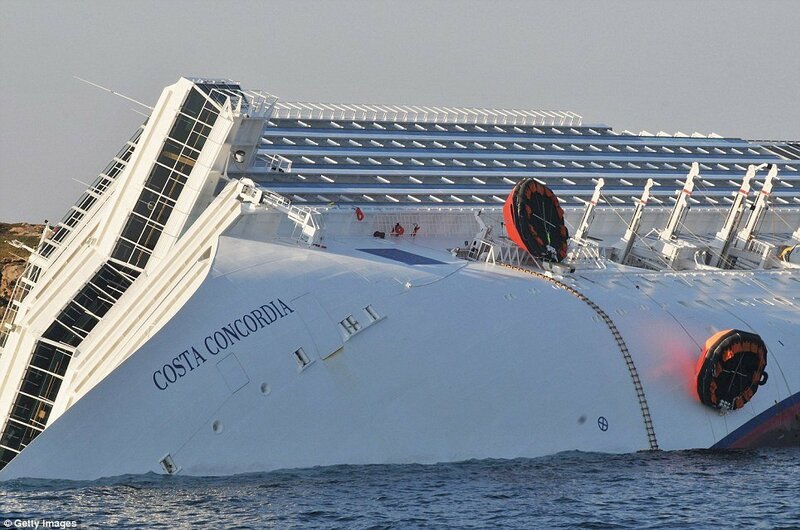 Operations to pump fuel from the tanks of the wrecked Costa Concordia cruise ship lying off the Italian coast have been delayed because of bad weather. Dutch salvage company Smit says it now hopes to begin work next week on pumping more than 2,300 tons of diesel out of the 290m-long vessel. The woman was wearing uniform, indicating she was a crew member. The ship ran aground on 13 January with more than 4,200 people on board. Another 15 people are still missing. “We were ready this morning [Saturday] to commence oil pumping in the course of the day,” Smit spokesman Martijn Schuttevaer told a news conference. Oil pumping is now expected to begin in the middle of next week. Bad weather is forecast until Tuesday. 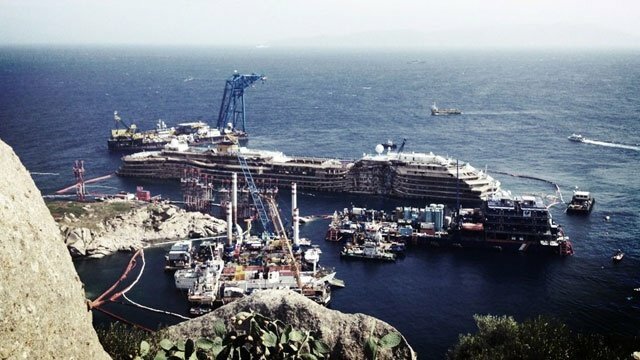 Smit has withdrawn a barge that had been placed alongside the hulk of the Costa Concordia. The operation is expected to take about four weeks to complete. The delay will add to fears that a leak could cause an environmental disaster in the marine national park where the ship capsized. On Saturday morning divers searching submerged parts of the wreck found the body of a woman, wearing the ship’s uniform, on deck number six. No further details of her identity or nationality have been released. 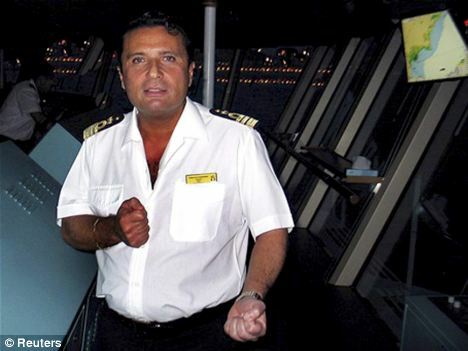 Captain Francesco Schettino, is under house arrest while his actions are being investigated.